Well, the announcement's a little bit late (I've been relying on Twitter far too much) but we are now in Milne May - my dyeing this month is taking inspiration from A. A. Milne. And there is a LOT of dyeing going on in preparation for UK Ravelry Day. We hit Wonderwool a couple of weeks ago, which was loads of fun but it really hit home that I need to concentrate on finding base yarns which are a little bit different. I think I've done pretty well - picked up some really beautiful Teeswater wool (all the way from Clitheroe) in DK weight and I've found a lovely new sock yarn source - Falklands Merino, scoured and spun in the UK and it takes colour brilliantly. There's also some high-twist sock yarn, but more of that later. First - an actual FO! These are my April socks - Ravelry project here. I've knit these before (my first finished socks actually) so I got about halfway through the leg and just guessed from that point on. Turned out OK though! Shown here on my pretty new sock blocker I picked up at Wonderwool. This is the yarn, which is organically-reared Merino dyed with natural dyes. Which reminds me - I am convinced that there are people out there spreading ill-feeling towards natural dyes. Every time you mention them on Ravelry, someone will pipe up with "They're not safe! You're destroying the planet!". And inevitably it turns out that this person has never done any dyeing and is just repeating the nonsense they've read elsewhere on Ravelry. So here's my short attempt at redressing the balance. No, you probably shouldn't use something dyed with natural dyes as a wall hanging or similar. The colours will fade. But so will anything if it's left in direct sunlight. Mostly what we're talking about is socks - which spend most of their lives either in drawers or shoes. People seem to think that natural dyeing needs lots of dangerous chemicals and metals. Not at all so. Yes, sometimes you can use metals to get a greater range of colours from your dyes. But they are not necessary and - by the way - not mordants. I use alum to mordant, which is a "chemical" but among other things it's used in water purification. Apparently you can't even get any nice colours from natural dyes, so why would you want to use them anyway? Hmm. Well, one look at this page of the Natural Dye Studio's website should answer that question. Well, that's my view of it anyway. So next time someone tries to tell you about the evils of natural dyes, tell them to shut up and read a book, hmmkay? Rant over and Kirrin is in test-knitting now and will be ready for UK Rav day. The next pattern probably won't be, because I want to make sure it's 110% right. That next pattern is for socks, using my new high twist sock yarn, which is an absolute dream to work with. 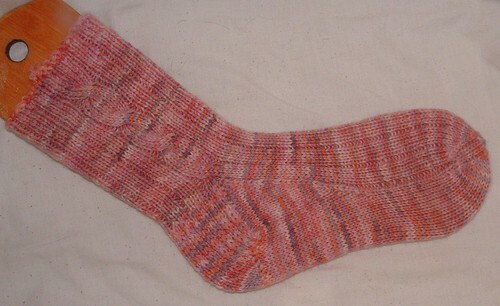 I've finished the first sock and I'm about to start the second and double-check the pattern as I go. It's got a bit of a "different" heel, which fits me better. Anyway, it's called Hallows and Horcruxes and I'll be looking for a couple of test knitters in about 2 weeks.